Sonos, the company that creates home-wide wireless streaming music systems, has released the Play:3, a $299 powered speaker that incorporates nicely into the rest of the Sonos family. 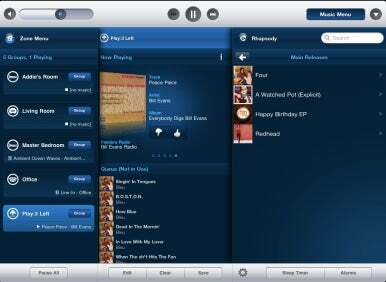 With a Play:3 jacked into a router via an ethernet connection and the Sonos Controller app for iPhone or iPad (and even Android), you can easily fill a room with sound from your iTunes library, Internet radio, and services such as Pandora, Rhapsody, Napster, Spotify, Mog, Rdio, Last.fm, SiriusXM, iheartradio, Stitcher, Aupeo, and Wolfgang’s Vault. The Play:3, available in black or white and weighing in at just under six pounds, is smaller and lighter than the larger ZonePlayer S5 ( ) I reviewed in late 2009. (The S5 has now been rechristened the Play:5 in a general rebranding of all Sonos products.) It bears a single ethernet port on the back as well as a mounting socket, should you wish to place it (or a pair of them) on the wall. The top of the unit includes the usual volume and mute buttons. Unlike with the Play:5 there’s no headphone or line-in ports. The speaker comes with a detachable 6-foot power cord as well. Inside you’ll find three speakers—a single tweeter and two 3-inch midrange speakers. The Play:3 uses a passive radiator to pump up the bass (versus the Play:5’s ported bass setup). Each speaker is powered by its own dedicated Class-D digital amplifier. The Play:3 supports MP3, WMA (including purchased Windows Media downloads), AAC, Ogg Vorbis, Audible (format 4), Apple Lossless, FLAC, and uncompressed WAV and AIFF files. As with other non-Apple hardware, it can’t play older, DRM-saddled audio purchased from the iTunes Store. 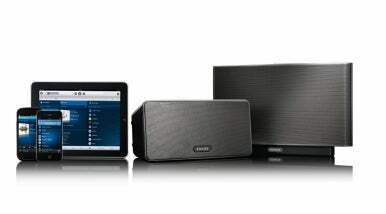 Sonos’ gear is remarkably easy to set up. Connect the Play:3 to your router via ethernet or use its wireless capability to add it to an existing Sonos system that has another component plugged into a router (a Sonos Bridge, Play:3, Play:5, ZonePlayer 120, or ZonePlayer 90), launch one of the Sonos controller applications (Sonos makes such applications for Mac, Windows, iOS, and Android), select the Add a Sonos Component command, press the Volume Up and Mute buttons at the same time on the Play:3, and the application adds the unit. Once added you then direct the Sonos software to add your iTunes library (or music in other directories on your computer’s hard drive or from a NAS). You can then set up accounts for streaming services you’ve subscribed to such as those mentioned above. I’ve observed people who’ve never owned a Sonos product complete setup in under five minutes. It’s that easy. When reviewing the S5/Play:5 I commented that I found it a little too bassy for my tastes. I’ve since purchased a pair of them and I still find that they try a little too hard to produce a rich bass. I’ve used the onboard EQ settings to adjust the sound more to my liking and I’m now quite happy with them. When listening to the Play:3 I returned the Play:5 to its factory settings and put the two side by side to compare their sound. I have to say that I prefer the out-of-the-box sound of the Play:3. While its sound isn’t as “big” as the S5, its overall character seems more balanced to me. I never got the sense that any particular frequency was jacked up to make the Play:3 sound bigger than it was. And by that I don’t mean that the Play:3 sounds like a small speaker, only that it’s not artificially boomy. In fact, when I set up the Play:3 in my living room and asked my wife and daughter to listen to it, they were amazed at the sound coming from such a relatively small speaker. It wasn’t until I flipped over to the larger B&W speakers I normally use for listening in that room that we noticed the Play:3 lacked some of the airiness and bass definition found in those larger speakers. What you also notice is, of course, the lack of much in the way of a stereo field. These speakers are quite close together and unless you’re sitting within a couple of feet of them, you don’t hear a lot of differentiation between the left and right channels. But there is some. How can I tell? Simple. When you place the Play:3 in a horizontal position, it plays the left channel from the left speaker and the right channel from the right speaker. When you flip the box into a vertical position, it plays mono—pushing both channels from each speaker. You can hear the difference in the sound when you do this. Turn the Play:3 back to a horizontal position and within a few seconds you hear the music spread out as it switches from mono to stereo. That may sound like a gimmick, but it’s actually a very clever design. Producing a stereo sound from bottom to top instead of left to right would sound odd. Because of its size and lack of a broad stereo field, the Play:3 is a perfect companion in the kitchen, bedroom, or as a unit you can take outside (or on a road trip when you know you’ll have access to a router). But you needn’t confine it to a small room. The Play:3 is loud enough to fill all but the most cavernous rooms and, again, it sounds great. If you demand that broader stereo field, Sonos has a solution—buy two Play:3s. Like the Play:5, you can gang two Play:3s into a stereo pair. Within the Sonos software you can configure one to play the left channel and the other to play the right. (You can’t create a stereo pair from a Play:5 and a Play:3, nor would you want to given the different sound and volume they produce.) I tried two Play:3s in this stereo configuration and the sound was terrific. Again, the two Play:3s didn’t match the high end and crisp bass of my full-sized B&W speakers, but considering that the sound was coming from four 3-inch speakers and a couple of tweeters, what did come out was as good or better than many well-regarded bookshelf speakers I’ve heard. Setting aside the sound and ease of setup, the real benefit of a Sonos system is the ability to stream an endless supply of music to any Sonos unit you own—and, unlike with Apple’s AirPlay, stream different music to each unit you have. Logitech’s Squeezebox players offer this same kind of different-music-to-different units service, but their speaker-bearing gear (such as the Squeezebox Radio ( ) doesn’t match the quality of Sonos’ nor do they offer as many subscription music services. And Sonos’ controller applications are beautifully designed and easy to use. As a long time Sonos user, it’s a musical experience that I treasure. At $299, the Play:3 (in league with a free controller app and compatible mobile device) makes the Sonos experience affordable for a greater number of people. As evidenced by my other reviews of Sonos products, I’m completely sold. My guess is that when you hear a Play:3 of your own and imagine the musical joy it will bring to your life, you will be too.